I have developed a passion for willow weaving including Traditional English Heritage Basket making, Willow Sculpture and Living Willow Structures. I sell basketry products from my studio at Haworth Art Gallery in Lancashire, and at various Fairs and Events as well as undertaking Commissions and offering Workshop opportunities to individuals, schools, community groups and organisations. I am currently researching Heritage Basket making in Lancashire and trialling the varieties that were traditionally grown here. 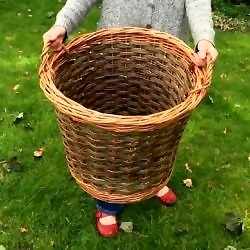 Traditional English Heritage Baskets including repairs, Willow Sculpture, Living Willow Structures - planting and maintenance, Garden willow such as obelisks and hurdles.